McCombs School of Business is a top MBA program and part of University of Texas Austin. The full-time program is small; the class of 2017 is 267 students. McCombs average GMAT is 694 and average GPA 3.40. The acceptance rate is at the higher end of the spectrum at 35%. UT Austin also has an evening business school with more relaxed admissions criteria. For the evening MBA, GMAT is 640 and GPA is 3.34. 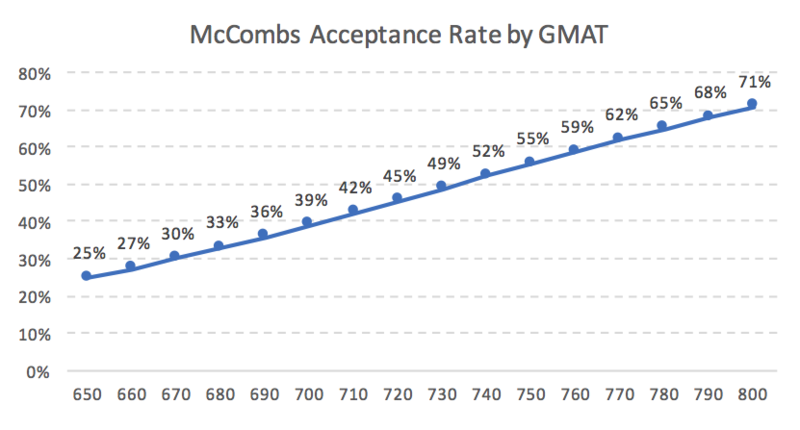 GMAT has a strong impact on acceptance rate at McCombs. If you raise your GMAT by 100 points, from 650 to 750, your chance of admission increases by 120%. Even with a relatively low GMAT of 650, an applicant still has a respectable 1 in 4 chance of admission. Although GMAT is critical when applying to University of Texas Austin, GPA does not appear to be important as long as it is above 3.0. When I built the acceptance model for McCombs, GPA was one of the first variable eliminated. 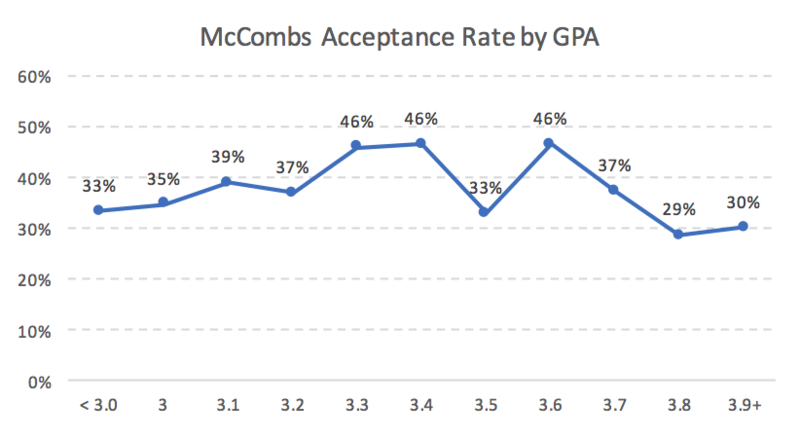 As you can see in the graph above, GPA seems to have no impact on acceptance rate. Data is sparse below 3.0, so I cannot be confident how low an applicants GPA can be before it hurts them. 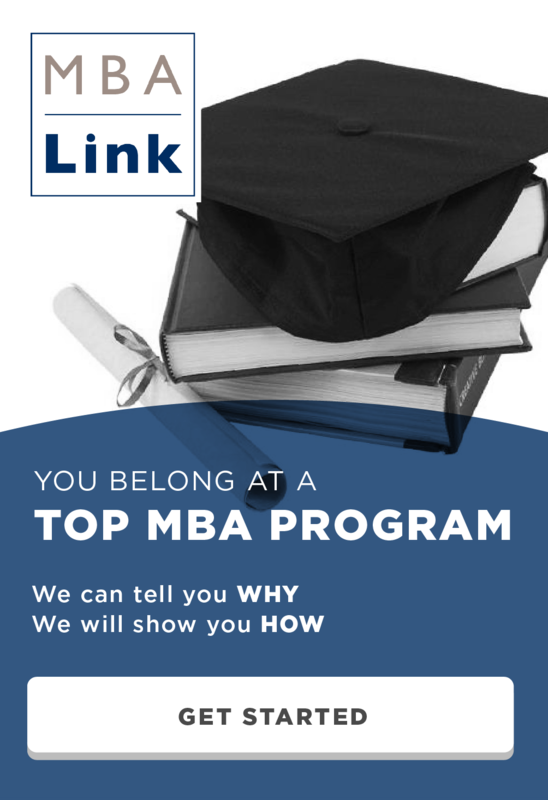 However, if you have a low GPA and want to go to a top 20 MBA program, then McCombs is a great place for you to apply. When applying to McCombs, the round you apply during matters. 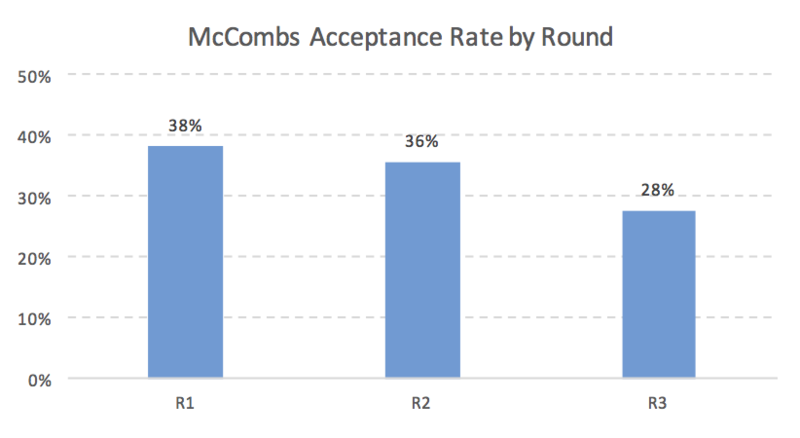 Round 2 acceptance rate is not statistically different than round 1, but there is a penalty for applying round 3. Round 3 applicants are 25% less likely to by admitted than applicants from the first two rounds. Although a quarter of applicants studied engineering for their undergraduate degree, McCombs does not seem to love engineers. The acceptance rate for engineers is two thirds that of non-engineers. On the other hand, McCombs loves economics majors. Applicants who majored in economics are 70% more likely to be accepted to McCombs than other majors. Data for this article was collected from GMAT Club, one of the best websites for preparing for the GMAT. This entry was posted in Admissions, GMAT, GPA, MBA, McCombs and tagged Admissions, Age, GMAT, GPA, Major, McCombs on August 26, 2015 by Data Guru.